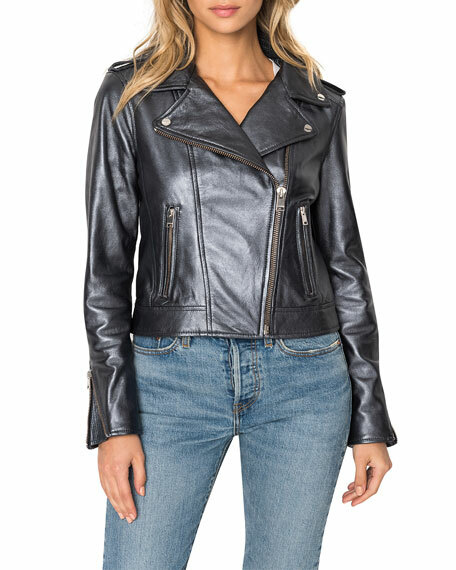 LaMarque "Donna" classic biker jacket in metallic lamb leather. Montreal-based fashion house LAMARQUE Collection set out to create timeless and sophisticated leather-driven pieces that unite classic tailoring with visionary design. The foundation and heritage material is leather, but the LMC design imagination now includes a world of luxurious fabrics. Each piece is hand-cut and hand-tailored by a technical team that has been carefully trained. For in-store inquiries, use sku #2558573.